Our day started early at 5:30 A.M. with the call from a concerned citizen about an owl that was hit by a car. We drove to the site but when we arrived the owl was no where to be seen. Some days just start off that way. We hope someone else found him and perhaps they will bring him to the REGI facility later today. We looked for things to be grateful for once we got back to REGI. We didn’t have to wait long. 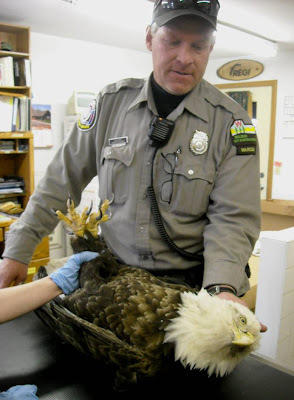 DNR Warden Jim Horne from the Shawano area called to say that he was transporting an adult bald eagle to REGI. The eagle was seen sitting in the same tree at the same place for five days. Jim was able to encourage the bird to come to the ground so he could capture her for transport. Jim arrived not only with the eagle but also a deer than had just been hit by a car to be used as food for our raptors. (Thank you Jim:)) The eagle is a beautiful adult female. She is banded with a USFWS band. We have already called in the band number so will soon find who banded her, where and how old she is. The bird weighed just over eight pounds. That is light for a female as she should weigh between 11-14 lbs. She has severe neurological symptoms and kidney failure. Working with wildlife and trying to find our reasons for their problems is like being a medical detective. We drew blood to check for lead poisoning and do other baseline blood tests. She does have lead poisoning but the numbers were not high enough to cause all of her symptoms. We are treating the lead poisoning and in the meantime checking her for other toxins. We are also treating her for a possible head injury. She has blood on her face and beak that could have been caused by an impact injury such as being hit by a car. Her behavior goes along with that diagnosis as well as did the location where she was found. The lead poisoning could have slowed her reaction time or caused her to be disoriented and contributed to her being hit by a car. Life is complicated for wildlife. What looks clear-cut at first often have underlying reasons. What happened next turned us all weak in the knees. She began to call out in a gentle voice as if to a mate. 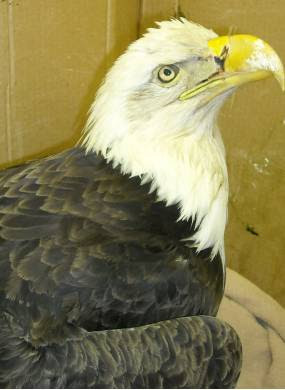 When I put her into the critical care box she curled her talons under as an adult eagle does when sitting on eggs. She began to take small bites of food from us as if she was taking food from her mate. Mentally she seems to remember sitting on her nest and is behaving as such. In over forty years of working with eagles this is the first time I have had this happen. Head injuries are odd. She could wake up tomorrow and be back to acting like a wild eagle. Our work can go from joy to heartbreak in the same minute. This case has us all working especially hard to see that she is able to go home again. Meanwhile Warden Horne is looking for an eagle nest in the area so we can keep track of her family while she is recovering. We admitted a short-eared owl with a wing fracture. A beautiful owl, the Short-eared Owl is a bird of the grasslands. They are disappearing from the Wisconsin landscape quickly due in part to newer farming practices such as cutting hay three times a year. Short-eared Qwls nest on the ground. 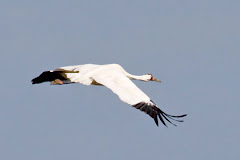 They are unable to get their young hatched and raised before the nest is destroyed with hay mowing. Destroying the nest and young is not done on purpose. Many people simply do not realize these owls and many other species nest on the ground. We are working to develop posters and informational hand-outs to alert not only those engaged in agriculture but people that for instance, may let their dogs run loose in what looks like an empty grassland area, that it can be an important breeding area. End of year field trips fill the schedules of our educators these days. We are delighted to be able to be a fun outdoor destination for schools and offer a solid educational lesson at the same time. We released a Barred Owl last night. He came in starving about six weeks ago from White Lake, WI. He is in great shape now and was anxious to leave and find him own mice from now on.